The TSOSA Advisory Group has served the Trieste System for a decade and is now contributing to the First International Planning Meeting of the International Year of Light 2015. The Trieste System on Optical Sciences and Applications (TSOSA) Advisory Group was established in 2003 by the late Gallieno Denardo with the purpose of offering advice on the development and co-ordination of activities in optics and photonics carried out or planned by the Trieste System. The Trieste System comprises the ICTP, ICS, ICGEB, Elettra Synchrotron Light Facility, the Laser Laboratory at Elettra, and the recent INFN-ICTP laboratory for Quantum Cascade Laser Research. Since 2003 the TSOSA Advisory group has assisted the Trieste System by providing expert advice and international support. It consists of representatives of International organizations (UNESCO, IAEA, TWAS, ICO), international societies (OSA, SPIE, OWLS, EOS), the Societa Italiana de Otica e Fotonica (SIOF), the National Academy of Sciences of the USA (NAS), the Laser, Atomic and Molecular African Network (LAM), and a representative of each of the institutions making up the Trieste System. 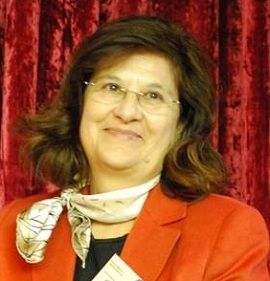 This year the TSOSA chair and ICO secretary, Angela Guzman, suggested scheduling the First 2013 International Planning Meeting of the International Year of Light (IYL) 2015 to meet at ICTP on the day prior to the annual TSOSA Advisory Group meeting. John Dudley, chair of the current Steering Committee of the IYL and elected chair of the quantum electronics and optics division of the European Optical Society, and Joseph Niemela, co-ordinator of optics and photonics at ICTP, and incoming head of the Office of External Activities of the ICTP, agreed on having ICTP host the meeting. A M Cetto, accompanied by representatives from UNESCO (incl. J P Ngome Abiaga) will prepare the IYL dossier to be presented to the ministries of foreign affairs of the major presenting nations, Ghana and Mexico, suitable for transfer to the Economic and Social Council (ECOSOC) of the UN General Assembly. This dossier will need to address the United Nations’ guidelines for International Years relating to organizational structure, secretariat, committees, etc. There was a consensus that a natural home for the Secretariat of IYL2015 would be UNESCO ICTP in Trieste. After transfer to the UN General Assembly, the aim is for official proclamation during the second half of 2013. According to the central mission of UNESCO, a priority for the IYL is to focus on developing countries. In the particular context of Africa, the IYL would commemorate African contributions to the science of light such as the thousanth anniversary of the publication of Kitab al-Manazir (Book of Optics), a seven-volume treatise on optics written by Ibn Al Haythem between 1011 and 1021. The YOL will cover wider cultural, philosophical and artistic aspects of light and its impact in our society. Multidisciplinary activities and partnerships with museums and social scientists will be pursued. Special attention will be devoted to activities of interest to young people. The international societies will encourage optics and photonics students at all levels and student chapters to get involved in outreach activities. Emphasis will be given to involving women role models and to prepare training activities for K-12 teachers. ICO recommends that all ICO territories initiate planning of their own local activities, co-ordinate all local initiatives, and look for support and involvement of national academies and ministries of education and science. There are already educational material and outreach activities in Europe and the USA that can be exported worldwide for the IYL. The organizers will collect existing material and make an effort to share it worldwide. In its role as Scientific Associate of ICSU, ICO will pursue ICSU involvement and the participation of social scientists through its new Planet Earth programme and will keep all ICO territories informed of new developments on the IYL initiative. The winners are Paul B Corkum (University of Otawa, Canada) and Ferenc Krausz (Ludwig Maximilian Universität, Munich, Germany). The King Faisal Foundation in Riyadh, Saudi Arabia, announced that physicists Paul B Corkum and Ferenc Krausz have jointly won the 2013 King Faisal International Prize for Science. They are recognized for independent pioneering work that has made it possible to capture the incredibly fast motion of electrons in atoms and molecules with a time resolution down to attoseconds. The prize consists of a certificate, hand-written in Diwani calligraphy, summarizing the laureate’s work; a commemorative 24 carat, 200?g gold medal, uniquely cast for each prize; and a cash endowment of Saudi Riyal 750,000 (about $200,000) to be shared equally. The winners received their awards in March in a ceremony in Riyadh under the auspices of the King of Saudi Arabia. The science subcategories cover a broad scope: physics, mathematics, chemistry, and biology, by a rotation cycle of four years. The previous physics prize was given in 2009 to Sir Richard Henry Friend and Rashed Alievic Sunyaev. Corkum is a Canadian physicist specializing in attosecond physics and laser science. 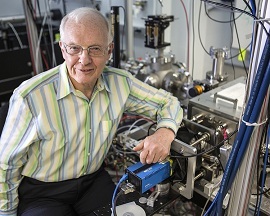 He holds a joint University of Ottawa–NRC Chair in Attosecond Photonics. He was born in Saint John, New Brunswick. Corkum obtained his BSc (1965) from Acadia University, Nova Scotia, and his MSc (1967) and PhD (1972) in theoretical physics from Lehigh University, Pennsylvania. Corkum started his career as a theoretical physicist but changed to experimental research when he arrived as a post-doctoral fellow at NRC in 1973. When asked during an interview at NRC, “What makes you think you can become an experimentalist?”, he replied: “It is no problem; I can take the engine of a car completely apart, repair it, and put it back together so it will work.” For more than 30 years, he has pushed the boundaries of human understanding of how light and matter interact. Among his awards are the Canadian Association of Physicists’ gold medal for lifetime achievement in physics (1996), the Royal Society of Canada’s Tory award (2003), the Optical Society’s Charles H?Townes award (2005), and the IEEE’s Quantum Electronics award (2005). He was awarded the American Physical Society’s Arthur?L?Schawlow Prize for Quantum Electronics. In 2007, he was inducted as an Officer to the Order of Canada and received NSERC's prestigious Polanyi Award in 2008. He is an elected member of the US Academy of Science. Ferenc Krausz was born 1962, in Hungary. He is a Hungarian–Austrian physicist, whose research team has generated and measured the first attosecond light pulse and used it for capturing electrons’ motion inside atoms, marking the birth of attophysics. Krausz studied theoretical physics at Eötvös Loránd University and electrical engineering at the Technical University of Budapest in Hungary. In 2003 he was appointed director at the Max Planck Institute for Quantum Optics in Garching and in 2004 became chair of experimental physics at the Ludwig Maximilians University in Munich. 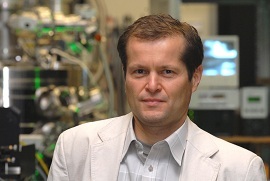 In 2006 he co-founded the Munich Centre of Advanced Photonics and began serving as one of its directors. 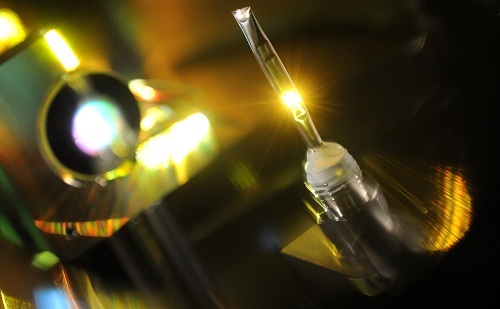 After advancing femtosecond laser pulse generation and measurement to its ultimate limit set by the field oscillation cycle of light, Krausz introduced a series of innovations, including the co-invention of chirped multilayer dielectric mirrors for dispersion control of ultrashort light pulses. Krausz and co-workers were the first to generate and measure an attosecond pulse in 2001.One year later, they demonstrated the ability of attosecond metrology to track sub-atomic-scale electron dynamics in real time. With controlled light waveforms, he and his collaborators demonstrated steering electrons in and around atoms, with several far-reaching implications. These include attosecond pulse generation with reproducible characteristics, sampling the field oscillation of light with an attosecond oscilloscope, controlling chemical reactions via steering electrons in molecules with the field of light, and real-time observation of electron tunnelling from atoms and atomic-scale electron transport in solids. For these achievements, he received the Wittgenstein Award in Austria in 2002 and the Gottfried Wilhelm Leibniz Prize of the Deutsche Forschungsgemeinschaft in Germany in 2006. In 2010, his group reported the first real-time observation of valence electron motion. The topic for the 2014 Prize for Science is mathematics and the deadline for all nominations is 1 May 2013 (see www.kff.com/). Sameen Ahmed KHAN, Engineering Department, Salalah College of Technology (SCOT) Salalah, Sultanate of Oman, rohelakhan@yahoo.com, http://SameenAhmedKhan.webs.com/. The Gallieno Denardo Award goes to Prof. Mohammad D Al-Amri. 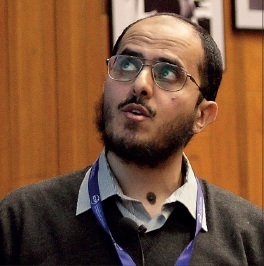 Prof. Mohammad D Al-Amri obtained his MSc with distinction from Sussex University, UK, in 2001, working with Prof. Barry Garraway on problems in the area of quantum optics. He was awarded his PhD in physics in 2004 by the University of York. His advisor was Prof. Mohamed Babiker and he was awarded the best doctoral thesis Stott Prize. Back in Saudi Arabia, in 2005, he joined King Khalid University for two years and then moved to the National Center for Mathematics and Physics (NCMP) at King Abdualaziz City for Science and Technology (KACST), where he established a quantum optics and informatics group. During his stay at NCMP, he established a fruitful research collaboration with Prof. M Suhail Zubairy and his group at Texas A&M University (TAMU). Several PhD students are participating in this collaborative programme between KACST and TAMU. Al-Amri and his collaborators have proposed a novel and simple optical lithography scheme for subwavelength lithography based on Rabi oscillations in order to exceed the diffraction limit. This method is similar to traditional photolithography but adds a critical step before dissociating the chemical bound of the photoresist. The subwavelength pattern is achieved by inducing the multi-Rabi-oscillation between the ground state and one intermediate state. The work in this area resulted in several publications. One of them, Physical Review Letters 105 183601 (2010), was spotlighted by the American Physical Society and cited in the Research Highlights section of Nature Photonics, vol. 5, January (2011). He and his collaborators have contributed in quantum information with a protocol for the teleportation of arbitrary quantum states of four-dimensional qudits, Phys. Rev. A 82 022329 (2010), and discussed quantum teleportation of a high-dimensional entangled state through a single quantum channel, J. Phys. B: At. Mol. Opt. Phys.45 095502 (2012). Recently they also presented a scheme where the entanglement change of a two-qubit state due to amplitude damping or weak measurement can be probabilistically reversed, Phys. Rev. A 82 052323 (2010). The reversal procedure involves a weak measurement, preceded and followed by bit flips applied to both qubits. They have proposed a linear optics scheme for the experimental demonstration of these procedures. Their current scheme, J. Phys. B: At. Mol. Opt. Phys. 44 165509 (2011), is based on repeated applications of Hadamard and CNOT gates, work which was granted the US patent No 20120098564. Maria L Calvo announces that ICO are seeking nominations. To all Territorial Committees and Bureau members, in August 2014, the 23rd Congress of the International Commission for Optics, with the title “Enlightening the future,” will be held in Santiago de Compostela, a historical city in Northern Spain, 25–29 August 2014 – at the time that the General Conference of the 23rd General Assembly (GA) will take place. At this time a renewal of the ICO Bureau has to be undertaken. It is expected that all of the 52 ICO Territorial Committee representatives will attend the GA and will participate in these important elections. Nominations for ICO Bureau officers are sought now. The position of past-president for the term 2014–2017 will be assumed by our present-president, Duncan T Moore of the USA. Candidates are sought for the offices of president, secretary, associate secretary, treasurer, and eight elected vice-presidents, of which two must, according to the bylaws, represent industry. There are in addition several vice-presidents appointed by large optics-related societies and professional organizations that are associate members of the ICO Bureau. The ICO Nominating Committee for 2012–2014, made up of Kathie Bailey-Mathae (USA), Anna Consortini (Italy), René Dändliker (Switzerland), Ari?T?Friberg (Finland), Asher Friesem (Israel), Ajoy Ghatak (India), Min Gu (Australia), and Yoon Kim (South Korea), and myself as chair, are now receiving nominations. They will be accepted until 24 hours before the second business meeting of the ICO General Assembly in Santiago de Compostela. Meanwhile, we are anxious to identify candidates so that the endorsement of the ICO Territorial Committees can be made in a timely manner to indicate the candidate’s support. A letter requesting nominations has already been sent to the Territorial Committees with election procedures, and an additional letter will be forwarded to remind the territories of their responsibilities. We hope to have a healthy and varied list of candidates in place by 28 February 2014, at which time all members will receive information as to the nominated candidates so that they can identify those that they wish to support for any specific office. This is one of the most significant and important activities for ICO members. Their vote, in large measure, will determine the character of the ICO going forward in what our community will consider as important actions to enlarge the presence of optics and photonics all over the world, not restricted to science and technology platforms but also in education, promotion of young researchers and entrepreneurship programmes. Moreover, we need a worldwide distribution of candidates that cover all large areas of optics and photonics. After 15 April 2014 I will send all ICO members an update about the status of the nominations, so that they may identify those candidates that they wish to endorse. I would like to remind all that this will be very special elections since the UN, next Fall, will consider the declaration of 2015 as the International Year of the Light, and in which ICO may play an important role for dissemination and co-operative activities with other international organizations and professional societies. Do not miss this opportunity. We need your voice and your ideas. Send your nominations by e-mail to mlcalvo@fis.ucm.es.